From the Vault: Annihilation has been released to the MTG masses at large and it certainly has moved the market in one way or another. Even in ways that defy common sense. I crossed off the name of the vendors here so that they don’t get a lot of flack for posting Ravages of War at absurdly high prices because I believe they have a right to post the card at whatever price they feel the market will pay. We, however, do not have be idiots and actually pay this price for a card that still has a very high chance of being reprinted. Wizards has been all about the Portal Three Kingdoms (P3K) reprints ever since including some of the legendary creatures from the set in FTV: Legends. They proved that they were willing to go all out and not just include them in a FTV product when they reprinted several of them in the Commander 2013 decks. I would avoid this card entirely for the time being until the hype for not being included dies down. Obviously Ravages of War was due for a spike because it was not included in the FTV: Annihilation. We can all agree on this point. Yet what is the true cost? Being able to have another Armageddon in all but name is great for both a player’s cubes and their Commander deck. Stores and players noticed that many copies had already been grabbed off the market and decided to make a last run to collect the remaining few and then try to sell them at a premium. Due to the low print run they could accomplish this if we are not careful. Since so few are for sale only seeing one or two prices could be very deceiving as to the true worth of the card. Cliff just wrote an article on Friday that touches on this very point and the current Ravages of War spike highlights his point perfectly. Just head over to eBay and the real story starts to reveal itself. Just last Thursday two non-English versions sold for less than $200. In the previous months, English versions had trouble breaking $350 per copy. Listing an English version at a price higher than $3000 is highway robbery. Do not fall into this trap, please do your research before picking up a card for your cube or Commander deck if the price seems absurd to you. From my perspective, not including Ravages of War in this recent FTV was a huge oversight from Wizards. Not only did they miss Ravages of War, which would have been my number two guess at the most likely to be reprinted in the set, but they also failed to reprint Damnation (my number one guess before release for inclusion) and All is Dust (my number three guess). These three cards in my opinion best represent a theme of annihilation, destruction, and devastation. In retrospect though, I can respect Wizards’ decision. Armageddon is an iconic card that carries with it unmeasurable quantities of Magic nostalgia. Not including it would probably have been weirder than having Ravages of War (which is frankly a card that not many players have ever seen). Not every decision Wizards makes can be financially focused. This sometimes gets sacrificed for flavor and historical relevance. Also consider that Damnation is probably going to be reprinted soon as well. With Commander 2014 on the way and the new Standard rotation coming in the future it is only a matter of time for this card as well. In addition, All is Dust already had a reprint through being a GP Promo so I think it was fair to skip out on it for the FTV. Even though I was disappointed that not even one of my top three choices made it into the product I can’t fault Wizards too much for excluding them. This was an ambitious set to put together, and no matter what choices were made a ton of players were going to be unhappy. No surprise here that the P3K reprints are the most valuable. 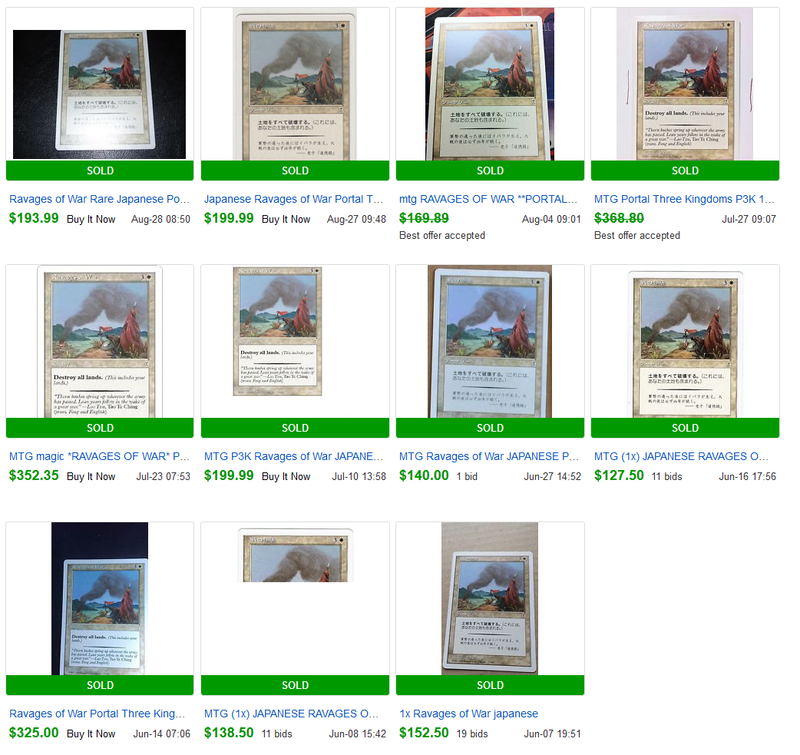 The most surprising part of this FTV is the lack of value compared to past FTV releases. $14 is not much value if you’re talking about the headlining card of the release. Nicol Bolas, Berserk / Sensei’s Divining Top, Ulamog, Grove of the Burnwillows, Mox Diamond / Aether Vial, Jace – see a pattern here? All these cards are worth at least $25 retail now which means they were probably worth substantially more upon their respective FTV release. Rolling Earthquake is barely even half the value of the lowest priced of these cards. Don’t get me wrong, giving the Magic community a version of the card that isn’t $180 is great for the game. It will get more people interested in picking up copies and could spur further interest in P3K along with any reprints they want to include in the next Commander decks. The only issue is that you are stuck with buying the FTV copies because the P3K versions haven’t moved much yet and it does not look like they’ll budge due to sheer rarity. It is funny to see here that the FTV: Annihilation reprints hardly even brought down the price of the original P3K Rolling Earthquake and Burning of Xinye. Their original English printings barely even dropped 10% upon the reprint. This could be attributed to the market catching up with the increase in supply. If not, then it would surprise me greatly to realize that just the rarity of the set alone could be the factor here. I could be severely underestimating just how rare the original print run is to find since I was expecting a much higher drop in value of the original printing. Clearly the FTV price reflects accurate market demand, since the new version of Rolling Earthquake is only $14 which is about average for cube / Commander viable cards. A $14 headliner doesn’t bode well for the future of the FTV: Annihilation product. Especially since many vendors are only selling the set as a whole for $45-$50 total. Many of the cards weren’t even on people’s radars. Upheaval, Firespout, Virtue’s Ruin? Did anyone even think to want these in here? They could have at least given Child of Alara art that doesn’t make it seem like a giant crying baby. The only cards that I would watch out for are Smokestack and Cataclysm in addition to the P3K red spells due to new art and first time foiling. These definitely have the potential to go up in the future from eternal demand. Other than these cards I’m not really expecting the rest of the set to do too much for a while. Based on the prices I’m seeing this looks to be the most unpopular FTV release yet, which is unfortunate since there was so much potential that could have been here. I touched upon this a little bit in the previous section so I’m not going to continue to harp on about the point. Yet based on the current prices the demand isn’t there like for other FTV’s. At least not yet. Maybe this will be a good buy for $40 looking back a few years down the road. Only time will tell. At this point, I would suggest staying away from the box set as a whole and instead pick up any singles you want. The singles are all very cheap in the set compared to past FTV releases and they have a good chance of going down even further once more of these sets are cracked. All in all, buying a FTV: Annihilation box set is risky because it will be hard to get much value out of it in the near future. However if you want everything in here, buying the box set is great because there has never been a cheaper FTV this close to MSRP. From my perspective, not including Ravages of War in this recent FTV was a huge oversight from Wizards. In retrospect though, I can respect Wizards’ decision. Maybe you just want to criticise the guy currently in charge of From the Vault? 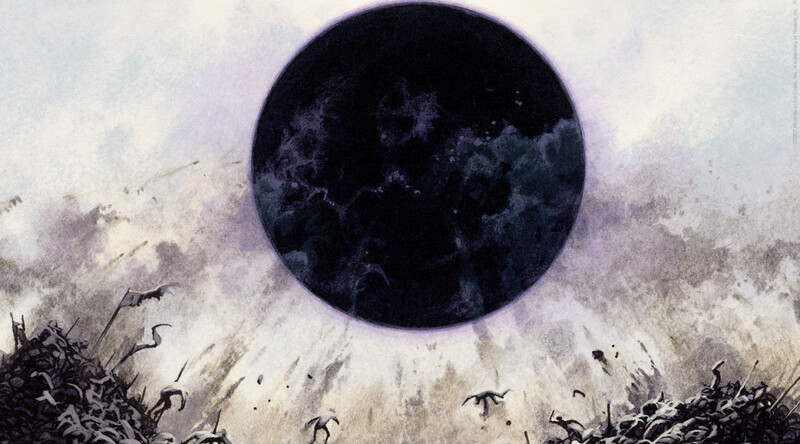 We might see Damnation and Ravages of War in Commander 2014. There can still be non-events in the calendar year, especially the year they reprint Onslaught Fetchlands. You can respect a decision from another’s perspective without agreeing with it, especially with a possible reprint of Ravages in the back of everyone’s minds. Unfortunately I think the possibility is almost nil for C14 since Commander players, and casuals in general, balk at land destruction and probably hate it more than their spells being countered. I would expect a Judge promo of Ravages before a C14 include. And yes, C14 is the perfect place to reprint Damnation which I elaborated on in the article. I was rather shocked at the reaction to the sell as well. My local Magic store is kind of an island in terms of location (compared to other, more distant stores). They took the stance of selling the set for whatever price they wanted, which turned out to be $79.99. When I balked, they just told me that they could. Instead, I drove an hour-and-a-half away and bought at the MSRP. It’s sad to see, though that even that was too high.